David began playing clarinet in 1972 at age 6. A few years later he added the saxophone and subsequently, the flute. 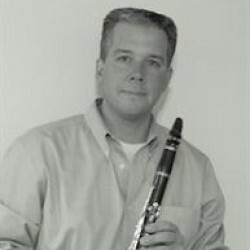 He has been playing professionally for 30 years and teaching privately for over 20 years. While attending Temple University, he had the opportunity to study with many of the finest performers and instructors in the Philadelphia region. Due to his interest in both classical music and jazz, his teachers included members of the Philadelphia Orchestra (Larry Wagner - clarinet,  Angelo DiMatteos - Flute) as well as some of the most well respected jazz players on the east coast (Larry McKenna - sax, Mike Natale - trumpet, Bob Shilling - jazz theory). David began a successful career as a free-lance musician, performing in various venues in New York City, Philadelphia,  Atlantic City and the Baltimore/Washington D.C. area. In addition, he also taught privately in Philadelphia and the surrounding suburbs. Since relocating to Sacramento in 1999, he has continued to perform as a free-lance musician in Northern California, while maintaining a private teaching schedule in Sacramento. David’s students are participating in the area’s concert/jazz bands, honor bands and several are members of the Sacramento Youth Symphony. I believe that a student’s passion for learning music begins with the instructor’s passion for teaching music. Even after 20 years, I find that I enjoy working with students as much today as my first year teaching. What fuels this passion, for me, is to constantly expand what I teach,  and improve the way in which I teach it. This includes things like finding new songs/styles to explore, incorporating new technologies in the lesson (computer software, mp3 background tracks), teaching not only the “notes on the page”, but also the history behind the music and continually fine-tuning my teaching style to address the learning style of each student. I find that if I keep it fresh for myself, it translates into a more energetic, productive and enjoyable lesson for the student. Age: I teach students of all ages. band/orchestra music and audition preparation. Recitals:  Recitals will be scheduled throughout the year. Although not mandatory, all students are encouraged to participate. Rate:  $100.00/month Includes 4(or 5) 1/2 hour lessons. Payment:  Cash, check or Paypal. Schedule:  Alternate schedule (hour lesson, bi-monthly time) may be arranged. Fun:  All students are required to have fun during the lesson - No exceptions allowed!